I really like this Namingway Edition hack by Rodimus Primal, which essentially cleans up the script of “Final Fantasy II” for the SNES in the U.S. and makes it more like the original Final Fantasy IV game for Super Famicom released in Japan. It has restored almost all of the original content from the Japanese game, fixed a number of bugs, and cleaned up a lot of errors in the script, as well as a few minor enhancements to the game. 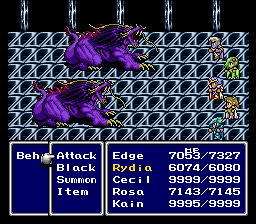 Generally it uses the canonical names that more recent official translations of Final Fantasy IV to other platforms use, in order to try and be more like an official translation and less like a fan translation. I basically agree with all of the design decisions made in this patch although I think maybe it might have been a bit easier if they started out using the J2E patch as a base and then restored a proper official-esque script to that one, since that would have prevented having to go through all the painstaking work of restoring content from the Japanese version of the game into the American version. The makers of this hack did things the hard way by starting with the American version of the game instead of starting with the J2E hack of the Japanese version, but it is quite good, in fact it is my favorite. 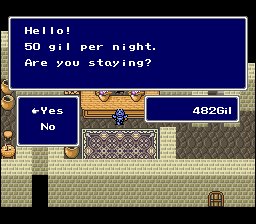 As far as the other options in English, the official “Final Fantasy II” localization Squaresoft did for the SNES in the U.S. is nowhere near as good as this, and this is an improvement on that. It is full of typos, it has the difficulty level lowered to make things easier, it has a ton of removed content and censorship, less battle commands, less items, less of everything, all in all, probably the worst version of the game. The J2E fan translation by the group J2E Translations is definitely a great improvement over the official release, not because of the script, the script had some obvious flaws, the most annoying one to me being the reference to a Backstreet Boys song, but by being based on the original Japanese version and restoring all the content that had been removed and censored, that by itself made it better than the official release. It is definitely an impressive release for its time and helped pave the way for better releases in the future, but its script is far too flawed for it to be the best version of this game. 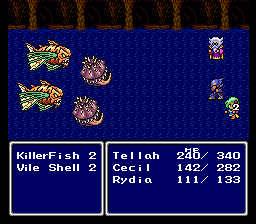 Project II by vivify93 is quite an excellent hack and improvement over the original Final Fantasy II U.S. localization on SNES. However, Namingway Edition is based on Project II and makes even further improvements, mainly improving the names of everything, hence the name “Namingway”, who is also obviously a recurring character in the game, as well as adding B-button dash, restoring some things to maps including the Developers’ Room, restoring enemy difficulty, retranslating battle dialogue properly, and restoring the original title screen. The only advantage Project II has over Namingway Edition is, currently and at certain other times, the latest enhancements from Project II’s latest version have not yet made it into Namingway Edition. But still, the numerous additional improvements Namingway Edition makes, to me outweigh the minor differences between the slightly older version of Project II that Namingway Edition is currently based on and the current version of Project II. But remember what I said about the idea of using the J2E translation as a base and just fixing what is wrong with that? Yeah, some other people did that. First, there was Cosmetic Changes by Joelsmith380, definitely an improvement over what J2E did, a good first step. Then, Spooniest came along, first putting out Cosmetic Changes 2, which improved on Cosmetic Changes, and then putting out J2Evisceration, even further improving things from Cosmetic Changes 2. J2Evisceration by Spooniest is clearly the best of this particular bunch. So, what do I think of J2Evisceration by Spooniest? Actually, I don’t know, I haven’t played it. I don’t know whether it is better or worse than Namingway Edition. Judging from what other people have said, it is pretty good, some people prefer J2Evisceration by Spooniest, others prefer Namingway Edition by Rodimus Primal, and it seems the people who prefer Namingway Edition to J2Evisceration slightly outnumber the people who prefer J2Evisceration to Namingway Edition. Anyway, J2Evisceration does not have certain improvements that Namingway Edition does like B-button dash, and also, only one version of J2Evisceration was released, just like only one version of Cosmetic Changes 2 was released, whereas Namingway Edition has had a number of updates and improvements. I have reported all the bugs I found in Namingway Edition (some of which are from its underlying Project II), and I went into great detail, and the developers of Project II and Namingway Edition have addressed them and Project II already came out with a version with fixes, and Namingway Edition probably will come out with a fixed version soon as it is also actively developed. J2Evisceration by Spooniest, though, is what it is, is at version 1.0 and staying there, and does not seem to be an actively developed project anymore. So any mistakes in J2Evisceration are probably here to stay while Namingway Edition is likely to have another update to fix most of its mistakes. Regardless, since I have not even played J2Evisceration, I have no idea whether at the present time it is better or worse than Namingway Edition. From what I have heard they are both very good. And finally, there are the other official English translations of Final Fantasy II, which are described in detail at Legends of Localization. Basically, the SNES translation sucked as described earlier. The PlayStation translation redoes things from scratch and is better but still has a lot of mistakes. The GBA translation is an improvement on the PlayStation translation, fixing many mistakes and improving terminology, so definitely better than SNES or PlayStation, although it does still have plenty of mistakes in it. The PSP translation improves even further on the PlayStation translation, and also updates the terminology and naming to be even better, but it also adds a few mistakes too, so while it is the best of the translations listed so far, it is far from perfect. The Nintendo DS translation completely retranslated from scratch, as well as making the game 3D, and this translation was really masterfully done, outdoing the PSP translation to be the best official translation. The mobile port for iOS and Android was originally a copied version of the Nintendo DS translation that had some mistakes added by accident, but Square Enix has fixed those mistakes in updates and now the mobile port has an identical translation to the Nintendo DS release, so it also has the best official translation too. The PC translation was based on an older version of the mobile port that still had mistakes added to it, and then it adds even more mistakes, so that one I would avoid. This information about the official releases is not from me playing those games, but basically my summary and interpretation of the article I linked to on Legends of Localization, an article that also recommended Namingway Edition to anyone who wants to play a fan translation. So if you are looking for an official translation, I would go with the Nintendo DS, iOS, or Android version since that is the best official translation. However, I like playing the original SNES game with the original 2D graphics and all that, rather than the 3D version that the Nintendo DS, iOS, and Android have. And I would bet that both Namingway Edition by Rodimus Primal AND J2Evisceration by Spooniest are BOTH better than any of the PlayStation/GBA/PSP official translations in that series. Playing the game in 3D just seems wrong, that is not authentic to how this game was originally designed. 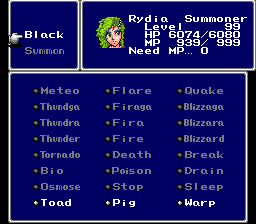 So ultimately, my favorite way to play Final Fantasy IV is to play Namingway Edition. As far as why I played Namingway Edition rather than J2Evisceration, I saw the thing on Legends of Localization and it had more positive reviews here. I should probably play J2Evisceration by Spooniest too since I really do not know enough about it to know whether it is better or worse than Namingway Edition. 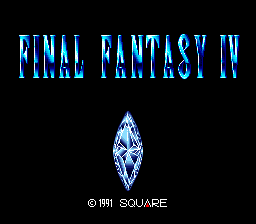 And again just to clarify, I have played precisely 3 versions of this game: the official SNES English translation that was released as “Final Fantasy II”, the classic J2E fan translation, and Namingway Edition, although I looked at all 3 of those versions in great detail. So, that being said, Namingway Edition is clearly the best out of all of the versions I have played. I might look into Spooniest’s J2Evisceration later but I would have to actually play it before reviewing it, one thing I do know is, Namingway Edition is awesome and at least currently, it is my favorite translation of this game. I highly recommend it to everyone, whether you are a spoony bard, a practitioner of lunar magic, or a white wizard who doesn’t even know how to cure your own desert fever since you’re too low-level to know the spell Esuna yet.